This is a nice trivia question for the next museum reception but what does it mean? First of all, the size of the museum isn’t based on the value of its collections. Although the artworks, historical objects, and archives are considered the most valuable part of museums, they’re not counted among the assets in their financial reports. For museums, assets are cash, investments, sales inventory, buildings, real estate, and equipment. When you mentally include the collections, these five museums have tremendous assets, so a much more interesting question is how well have they leveraged their billion-plus dollars of resources? The easiest way to analyze their financial management is to look at the bottom line–is there a surplus or deficit? It turns out that two of the five “billionaires” had deficits in Fiscal Years 2011/12: the MFA Houston had a deficit of $6.7 million and Colonial Williamsburg had a deficit of $15.7 million. Although that’s less than one percent of their assets and probably didn’t even raise an eyebrow at a board meeting, it’s larger than the budgets of most museums in the United States (yup, one might be able to say that Colonial Williamsburg loses more money in a year than most museums make, but it’s so rich it hardly affects their operations). These deficits, however, do suggest that financial management is a challenge at museums of all sizes, not just the small ones who lack the resources, knowledge, and experience of the big museums. Look again: two of the five (that’s 40 percent) of the biggest museums in America had deficits in Fiscal Years 2011/12. Another way to examine their management is to compare assets to revenue. In the case of the Smithsonian, its $3 billion in assets (blue bar in the first chart) resulted in $1.3 billion in revenues (green bar in the second chart). That’s a ratio of 2.3:1 (it took $2.30 in assets to generate $1 in revenue). For the Metropolitan Museum of Art, its assets of $2.75 billion resulted in revenues of $420 million–that’s a ratio of 6.5:1 (it took $6.50 in assets to generate $1 in revenue). In the 2011/2012 Fiscal Year, the Smithsonian was nearly three times more effective than the Met in raising revenue. Based solely on these ratios, where would you invest your money if you were a venture capitalist? This is perhaps easier to see at the MFA Houston, Colonial Williamsburg, and MOMA, which each had roughly the same size of assets but significant differences in revenues. MOMA had three times the revenue of the MFA Houston, even though they each had about one billion dollars in net assets. Certainly they are different types of museums operating in different markets, but is that sufficient to explain their varied abilities to raise revenue with their resources? We’ll have to dig deeper and look at the sources of revenue to uncover a possible explanation. What do you think are the biggest sources of support for America’s biggest museums? It turns out there isn’t any clear pattern–every museum has a very different mix of revenue sources. At the Smithsonian, more than 80 percent of its support comes from contributions and grants whereas at Colonial Williamsburg, it’s less than 30 percent. It seems that there’s no single business model to ensure success (sorry). The museums that experienced deficits do stand out for different reasons. Colonial Williamsburg relied heavily on program service revenue (activities related to the mission, such as admission fees for tours and events) while the MFA Houston received most of its revenue from investments (such as an endowment). Does this suggest a warning to those who urge sustainability by increasing program service revenue? Does a large endowment make an organization complacent when it comes to fundraising? What does it take to become one of the biggest museums in America? 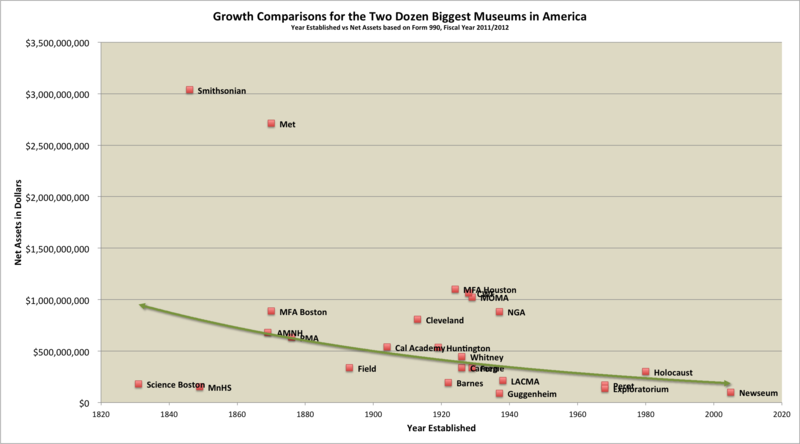 By comparing net assets to the date of founding for two dozen of the biggest museums, it’s clear that growth happens slowly over decades (the green trend line). What isn’t clear is why some grow faster than others. Look at the cluster of museums that were established in the 1920s. If this were a race, how did the Museum of Fine Arts Houston and the Museum of Modern Art get so far ahead of the Whitney Museum of American Art or the Barnes Foundation? This is a great dissertation topic that goes far beyond a blog post, but it does remind us that in the management of our museums and historic sites, we need to think about both the current fiscal year and the decades ahead. Growth happens best when it’s intentional, not accidental. This data is based on the most recently available Form 990 of more than two dozen of the nation’s largest museums. Non-profit organizations annually file a Form 990 with the Internal Revenue Service that discloses their financial status and management practices, which GuideStar posts online as a public service. Although the fiscal years for these organizations are not identical, they were the most recent available at the time of this study and cover the the fiscal years ending 9/30/2011 to 9/30/12, hence the use of “Fiscal Year 2011/12”. A more refined analysis requires the collection of several years for each institution. Form 990 is not required of government agencies (such as the National Park Service) and very small organizations. Some museums–the Crystal Bridges Museum of American Art and the J. Paul Getty Museum–might be counted among those with a billion dollars in assets however, they are Private Foundations and file a different report with the IRS, making comparisons to the museums that file Form 990 difficult. This makes one wonder what the investment portfolio of the MFA Houston looks like. Is it all oil? As I was scanning the Forms 990, the investments of the MFA Houston did jump out at me because $108M (30 percent of their portfolio) is held in hedge funds and $20M is held in “distressed debt funds.” Looks like their gambles paid off (but when they don’t…). You’d assume they’d be significantly into oil, but “energy/natural resources funds” represent only 15 percent ($55M) of their investments. Max, does CW count its historic sites as assets? They own so much real estate that doesn’t produce income per se – what revenue it does produce would likely be counted as “program service revenue” in your chart. That might account for their seemingly disproportionate revenue in that area. It’s interesting too that both the Met and MOMA have such significant sources of “other revenue” – is that from product development and licensing, do you think? CWF must count some of their historic buildings (or perhaps their recreated buildings), along with the hotels, retail stores, offices, etc. as assets because more than $700 M is listed on the balance sheet as “land, buildings, and equipment”. The two major sources of program service revenue were admissions ($19M) and taverns and colonial houses ($17M). At the Met, retail sales resulted in $43M in income but the major source of “other revenue” was the sale of securities which netted them $109M (royalties was a mere $210K). MOMA reported no income from royalties and retail sales income was $27M but again the biggest source of “other revenue” was the sale of securities ($58M).